Many authors of children’s Chanukah books still perpetuate two mistakes. One is that a chanukiyah is the same as a menorah, whereas the latter is actually the seven-branched Temple lamp looted by the Romans when the Temple was destroyed. The second is the rabbinic legend of the miracle of the oil, which is not actually part of the story of the Maccabean revolt and the Maccabees’ fight for the right to worship as Jews. The books reviewed here are sweet, but part of the time reading these books might be spent discussing these issues. While Light the Menorah (Kar-Ben Publishing) by Jacqueline Jules, with illustrations by Kristina Swarner, calls the chanukiyah a menorah throughout and highlights the miracle of oil, this “manual for the contemporary Jewish family” contains sweet reflections for each night of the holiday, a form of history, games, songs, recipes, crafts and blessings geared for a family with 4-to-10-year-olds. 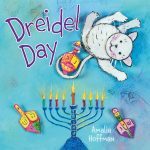 Dreidel Day (Kar-Ben Publishing), written and illustrated by Amalia Hoffman, is a cute board book for babies, infants and toddlers. It teaches readers numbers one through eight and some words related to Chanukah. How It’s Made: Hanukkah Menorah (Apples and Honey Press) is by Allison Ofanansky and photographer Eliyahu Alpern. These two creative people have once again combined their talents to produce a new book in their “How It’s Made” series. Sadly, the authors only refer to the chanukiyah as a menorah. Nonetheless, this is an educational and fun book, which explains the materials needed to make a candelabra, shows examples of them and provides instructions on how to make one, as well as how to make candles and olive oil. The book ends with songs, a recipe for potato latkes, instructions for playing dreidel, a matching game and the blessings. The text is child-friendly and good for all ages, especially 4 to 8. 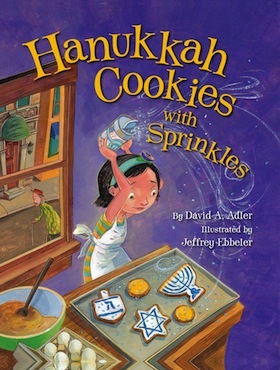 Hanukkah Cookies with Sprinkles (Apples and Honey Press) by David A. Adler and illustrator Jeffrey Ebbeler was published a few years ago, but it was new to me, and I hope it’s new to others, as well. Sara is a little girl who is very observant about things she sees from her apartment window. One day, she sees an old man pick up a piece of bruised fruit from a box next to the market. She then decides to leave things for him. Soon, she discovers he is the man who helps set up the chairs and collects books at the synagogue. She learns more about him as she practises the true meaning of tzedakah and spreads the idea to her family and classmates. The book’s Note for Families provides context for the story and traditions of Chanukah, as well as the meaning of tzedakah, and challenges readers to think about ways they can give tzedakah, too. Hanukkah Delight! (Kar-Ben Publishing) by Leslea Newman and illustrator Amy Husband is a board book. In it, all of the customs of Chanukah are rhymed with delight as a darling family of bunnies practises each one. The artwork is colourful and the details are really well done. The male bunnies and other male animals wear yarmulkes and the drawings of dreidels, children playing with the dreidels, latkes and presents are quite appealing. For any 1-to-4-year-old, this is a sweet way to introduce the holiday of Chanukah. 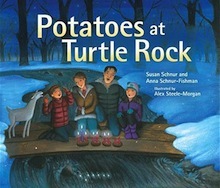 Potatoes at Turtle Rock (Kar-Ben Publishing) is written by Rabbi Susan Schnur and her daughter, Anna Schnur-Fishman, who are also the authors of Tashlich at Turtle Rock. It is illustrated by Alex Steele-Morgan, who also did the artwork for the Schnurs’ earlier companion book. Potatoes at Turtle Rock is the story of a family – mom, dad, teenage son (Lincoln) and daughter (Annie) – who have, as pets, a chicken (Richie) and a goat (Ubi). They also have their own Jewish holiday traditions. For Chanukah, the family goes to the woods, with Dad carrying a lantern, Mom carrying the chicken, Annie leading the goat and Richie pulling a sled. They make stops along the way, where Annie provides riddles. Although a little off-beat, this book for ages 5 to 9 shows children that every family can be original and creative and create their own traditions for Jewish holidays. A Hanukkah with Mazel (Kar-Ben Publishing) by Joel Stein and artist Elisa Vavouri is about Misha, a poor artist living outside Grodno, a city in western Belarus, in the late 19th or early 20th century. One cold winter night, he discovers a little cat. He takes her into the barn, where his cow lives, and then into his house. He names her Mazel, meaning luck. Chanukah is about to arrive and he begins a painting of a chanukiyah, since he has no money to buy oil for his chanukiyah. The story evolves when a peddler stops and discovers Mazel is his Goldie. With the themes of hope and luck, this is a very charming story for 3-to-8-year-olds.